Thermoliss Argan Oil line is your super-allied at the time to improve in a smoother look and without frizz. Thermoliss Argan Oil line is your super-allied at the time to improve in a smoother look and without frizz. In addition to helping the brush slide easily, it protects the hair from the heat of the dryer and flat iron, and offers an incredible boost of discipline and shine to the hair. Thanks to its thermo-reactive action, it creates a hydrophobic film on the cuticles, keeping humidity away and frizz in the past. And do you know the best? The smooth effect is gradual: the more you keep using, smoother your hair becomes. 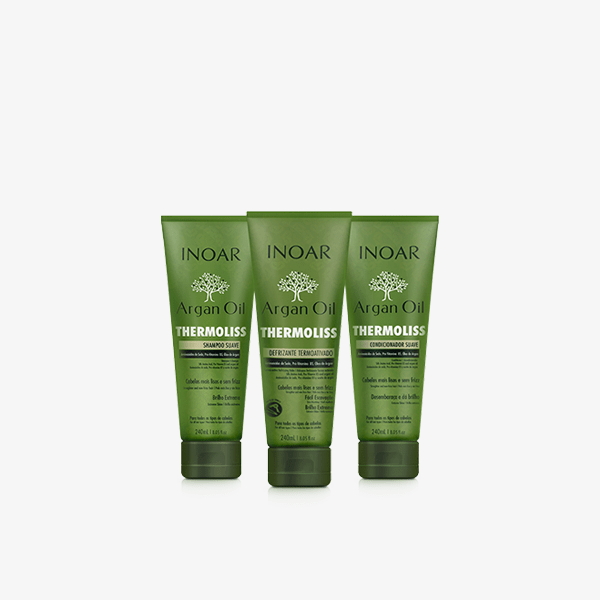 The Thermoliss line has special ingredients that work together for smoother and smoother hair without chemical action. With Inoar argan oil, known for its anti-frizz effect, frequent use ensures intense shine and a visible and progressive effect. Progressive effect: with frequent use, hair becomes smoother. Defrizing without chemical action. Curly, unruly and frizzy hair. Wash your hair with Argan Oil Thermoliss Smooth Shampoo. If needed, repeat the operation. Rinse and apply Thermoliss Conditioner, strand by strand, from the length to the tips. Pour a small amount of Thermoliss Heat-activated Defrizzer on your hand and apply it on the hair, strand by strand. Blow-dry your hair straight and finish with flat iron, to extend the straight effect.